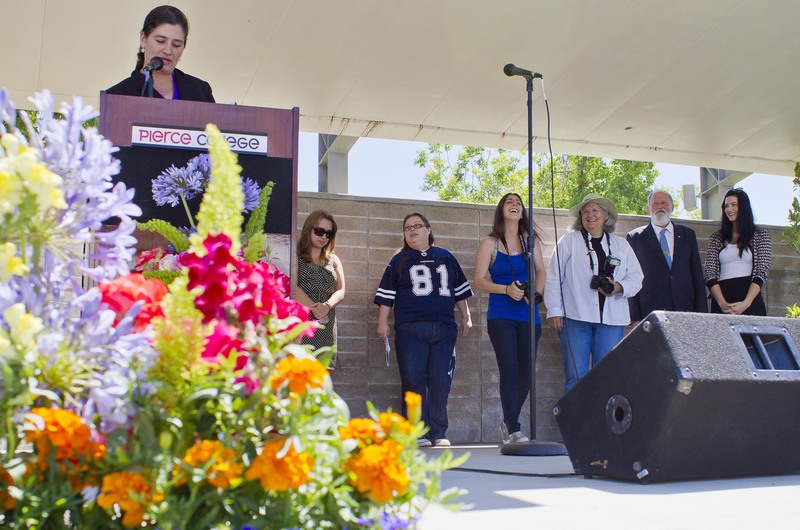 An awards brunch honoring some of Pierce College’s most prestigious students was held on the lawn of the Music Department this morning June 6, 2012. The annual Student Awards Brunch, organized by administration and faculty, recognized a total of 76 students across all departments, receiving a total of 136 awards. Leading the brunch as Mistress of Ceremonies was Professor Kathy Oborn, with a speech commending the hard work of these students. Emphasizing the diversity of the college, Oborn highlighted that more than half of the graduates tonight are female and nearly a third are foreign born. Oborn then passed the stage to just-retired professor David Schutzer and College President Kathleen Burke-Kelly to begin the presentation of awards. EJ Tormes, who served as Club Council president with the Associated Student Organization, was awarded the President’s Award by Burke-Kelly for her involvement on campus and in the community. Tormes was noted for her involvement in the Leadership Club and Alpha Gama Sigma, an honors society on campus. Burke-Kelly also gave mention to Tormes’ efforts in the Red Cross blood drive, Relay for Life fundraiser, and breast cancer awareness events. “It has been an honor and a great experience here at Pierce,” Tormes said. The few hundred attending applauded the scholarships and awards at this event that gave tribute to the efforts of these students, many of whom are graduating at tonight’s commencement ceremony. English Professor Richard Follett, presented two awards to “outstanding students” Mayra Fernandez and Jacen Cole Shoemaker, who will be leading tonight’s graduates through the commencement as Student Marshalls. Fernandez is transferring to CSUN and majoring in Accounting, while Shoemaker is a returning student who previously served with the United States Marine Corps in Operation: Iraqi Freedom. “They’re chosen by the ASO, and they’re wonderful students and they’re real leaders on our campus,” Follett said.